Changing the scale of your embroidery makes a big difference. Tiny stitching becomes cuter, and giant stitching becomes more impressive. And who doesn't want to create something impressive? 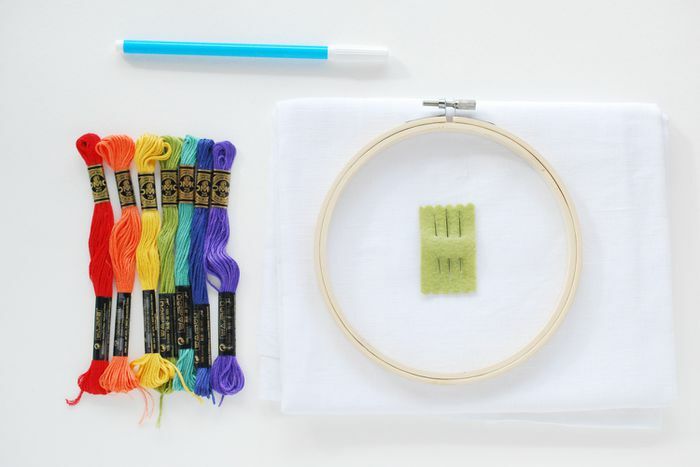 The technique for stitching at a larger-than-normal is much easier than you might expect, and only requires simple supplies and your favorite stitches. Embroidery artist Jenny Hart has created several giant pieces, including one worked with only running stitch. The embroidery pictured above isn't huge, but it's only a sample to show what this kind of stitching looks like, with embroidery floss, thimble, and scissors for scale. If you were to look closely, you would be able to count exactly 111 stitches. When was the last time you were able to accurately count the number of stitches in a 4in x 7in piece of embroidery? Something this size typically has many more stitches, but the magic of giant stitching means that fewer stitches cover a larger area. In fact, enlarging a design to giant proportions won't add a lot of time to your stitching. Your embroidery time will only extend a bit as you follow a few tips that will give you the best results possible. As with any embroidery, it's good to have the right supplies. The materials for giant stitching aren't too different from what you normally use, but they are a little bigger. Choose a fabric that has a large weave that will allow thick thread or yarn to pass through as easily as possible. Osnaburg is a utility fabric that is soft and works well. Burlap is more rustic but is excellent for giant stitching. Even some types of linen can be a good choice. Just look for some space between the warp and weft. It might be tempting to work in an enormous hoop, as used for quilting, but it's best to use an extra large standard embroidery hoop. Usually, about 10-12in is good. As you work, you will need to move the hoop around. For giant stitching, the bigger the thread, the better. Perle cotton will work, especially if you can find some with larger numbers. Number 1 perle cotton is the biggest they make and is certainly bold! Tapestry wool and other thick embroidery threads are good choices. You can also use different types of yarn. With any of these, if your fabric and needle can accommodate it, you can use more than one "strand" to thicken the lines. Select a needle that you can easily thread with whatever type of thread you are using. It should also be able to pass between the threads of the fabric, without piercing them. Darning or chenille needles are usually the most suitable. Even with the most open weave of fabric, the thread or yarn you use will get a lot of wear, so start with no more than 24in of thread. Depending on your materials, you may even want to only use 18in. Just because your stitching is larger, doesn't mean the thread should be longer! When starting and ending your giant embroidery, a knot is helpful. It may not be the best embroidery practice for this, but it's far less frustrating. As you stitch, try to always pass the needle between the weave of the fabric. The spaces between the warp and weft will give the needle and thread or yarn more room and create less wear and stress on the thread. You will most likely need to wiggle the needle through each time you take a stitch. Don't just pull, as it makes break the threads of the fabric. Most embroidery stitches will work for giant embroidery. Start with the basics and then expand from there. One of the most important ways to make your stitching larger is to make the stitches themselves larger. You can at least double the length of your stitches, and if the piece is unlikely to have much come in contact with it, you can go longer. Just be careful that the stitches won't snag. If you do want to take longer stitches, try using the same technique as with couching. The tacking stitches can be with the same thread or yarn you are using or with one or two strands of matching embroidery floss. Stitch as you normally would, but with one exception. When working satin stitch, normally you are always coming up and going back down on opposite sides of the area you are filling. With giant stitching, come up on the same side you just went down, and repeat. Each satin stitch should be right next to the previous stitch. This will prevent puckering of the fabric. When passing an extra large needle and all that thread thickness through the fabric, you'll find that it leaves a noticeable hole when you have to pull out stitches. If that happens, use your fingernail to work the fibers back where they should be. And that's it! The process really is simple, so grab some supplies and give it a try. 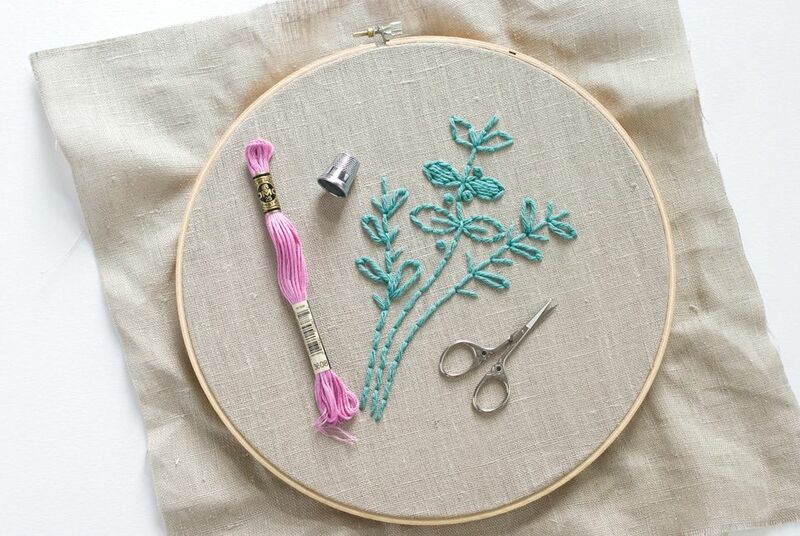 Now, what will you use your finished embroidery for? It makes an impactful wall hanging, a quick to stitch pillow, an easy-embellished scarf and more. You could even embroider a giant blanket in less time than you'd ever expect! What Is Sashiko Folk Embroidery?